10 years after the collapse of the Subspace Emissary a new world was born from an unknown blast wave. 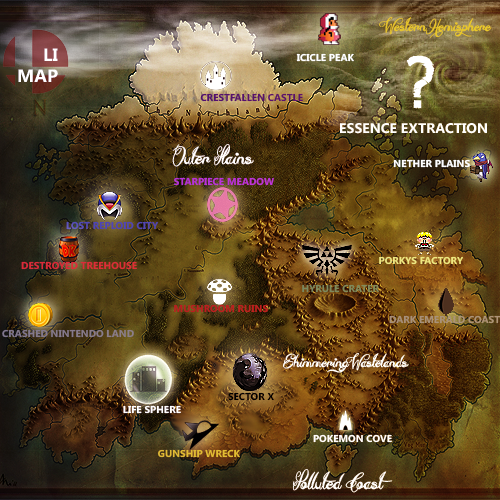 It was composed of notable places such as the Mushroom Kingdom, Hyrule, Sector X, Zebes, and many others, it is known only as Li. Characters from all walks of life are forced to work together on this planet in order to survive, cause you see... there is one major problem: a disease known as Starvia. Before anyone could even begin to know the wonders of Li the disease spread like wildfire. It turned characters from all backgrounds and abilities into infected beings that glowed with the familiar black-purple aura of the Subspace foes. Groups of the tainted characters gathered in the west presumably in search of the diminished essence of Tabuu; and the origin of the explosion. The courageous warriors of the Smash Brothers universe banded together to find this point of extraction and destroy whatever essence of Tabuu was left. Leaders in battle, Mario and Sonic both have very different views on what they should do to end this plague and have been arguing. Mario wishes to recruit all the brothers and sisters of the smash universe to push towards the point of essence and battle their way to victory just like they did on Subspace, but Sonic wishes to create a massive bomb to destroy the planet and flee to find a new planet. Without a majority vote on how the Life Sphere wants to proceed Sonic and Mario are stuck wondering what to do. Now it is up to the newcomers and all the other brave souls willing to step up to the plate to choose who's side to take, be it Mario, Sonic, or their own method. It's time for a stand. But could Tabuu still be alive? Do Master & Crazy Hand still lurk to wreak havoc on the Smash Bros? How much longer does the planet have before the Starvia overcomes the Life Sphere? With recent findings it may be possible to end the Starvia plague! But it will be a hard road ahead. L E T ' S B R A W L ! Believes in doing the most good and often chooses to make peace rather than fight. He hates arguments, created and endorsed the "No Hero Left Behind" act on Planet Li to ensure maximum hero safety and rescue, and wishes one day for everyone to get along and end the Starvia plague as a single cohesive unit. Known as the ideal hero for his many feats, Planet Li salutes this man as a huge asset to ending the Starvia outbreak. Mario often aims to protect and defend only when he absolutely has to, otherwise he'd rather enjoy a peaceful living atmosphere with his brother, Luigi. His biggest hope is to have no causalities during this deadly epidemic and to ensure survival and safety for all of the planet's residents. He, Samus, and Sonic have been trying, key word trying, to work together to come up with a plan to save the planet but all have many different visions on how to do this. Mario wants all of those willing and able to fight to push with him to the Essence of Extraction and destroy whatever is causing this plume of disease, then turn the planet into a peaceful world to live in. But there are complications. 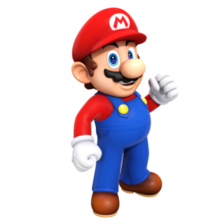 If Mario were to send the entire population of Life Sphere to fight with him to the western hemisphere, the diseased air may infect, if not kill, them all. Even if there was a way to breath healthy and survive the waves of diseased oxygen, the amount of danger and enemies ahead may be too much for the willing fighters to handle. Although it has its flaws, the positives are there as well. If successful, the entire essence would be wiped out in a matter of days, the planet's oxygen would slowly return to normal, and life would return. Peace would be achieved and everyone would be able to start their new lives happily. Those once infected could then be cured soon after, and help rebuild life on planet Li. As one can see, it's a big gamble if Mario's theory was tried. But for now all he can do is wait to see if he is the hero Li wants. He can usually be found in his house at Brightwing Lane eying pictures of his now destroyed kingdom and thinking up new strategies to overcome this darkened time. Unable to stand still and a love for fun, exercise, attention, and chili dogs, Sonic is a firm believer in fending for yourself but can't say no to rolling over villains and buzz kills. If you're boring, Sonic would gladly leave you in the dust. He created and endorsed the "Blue Strap Of Safety" act to encourage those that cannot fight to stay behind and do what they can to help the Life Sphere. Wants desperately to end the Starvia plague quickly and by himself. SSB Li Biography: Known as the arrogant gladiator to his counter parts, Sonic relies on only himself to get the job done and ensure safety for everyone else. He believes he is the key to ending the disease and saving everybody. However, due to numerous complications and countless arguments with Mario, Sonic is forced to hold back and tweak his thinking. Often wanting Mario to be chained up somewhere, Sonic reluctantly keeps to himself and his own plans until the community of Life Sphere eventually give in to his demands and he saves the planet the way only he knows how: destroying it. Often bored out of his wits from being forced to stay within Life Sphere, Sonic has been drawing up blueprints of a massive bomb that can be launched from outer space to destroy Li and the essence. He wishes to send the bomb off right on target with the point of essence and destroy the entire area with acidic chemicals that would zap the essence and the planet. However, like Mario's plans, it has flaws. If successful, the essence would effectively be destroyed. But the entire population of Life Sphere would need to find a new planet. He would make sure all survivors help him create ships to send him and everyone else into space to find another planet to live on. MOST would probably successfully survive upon leaving the planet and finding a new home. The flaws are just as broad. In addition to destroying a potentially supportive planet, it would take years to make a bomb large enough to destroy the point of essence. The bomb could also create complications and explode too soon or too late. In order to launch the bomb, the Life Sphere citizens would have to be evacuated in a timely manner and a clean sweep of the planet for any survivors before the bomb detonation would have to be done, which could take months. Finally, it would take years to find material enough to make space ships if possible at all, and with all the accumulated months and years added up it may be more trouble than it's worth for the community. Until he gets approval Sonic is found all over the Life Sphere and never in one spot clearing his head, you'd have to look hard to find him. She is not as argumentative as Mario or Sonic and would rather observe and analyze outcomes. With wisdom beyond her age, Samus trusts wholly the power of technology and loves tinkering with anything that she can get her hands on. She'd rather protect what she can than go head first into a battle that doesn't need to be fought. Samus Aran is responsible for creating, pioneering, and updating the Central's powerful protective shielding aptly named: The Life Sphere. 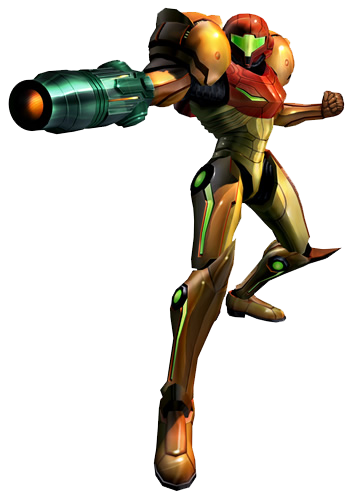 SSB Li Biography: Known for her unmatched skills in combat and bounty hunting, Samus Aran is often looked up to as the one that makes the key decisions involving battle plans and technology within The Life Sphere. She isn't known to argue or debate, and her only plan to end the disease is to continually update and tweak The Life Sphere to ensure everyone's safety. She is a female of few words, and would rather focus on her work than talk to anyone. She leaves the idiotic decisions and the bickering to Mario and Sonic. 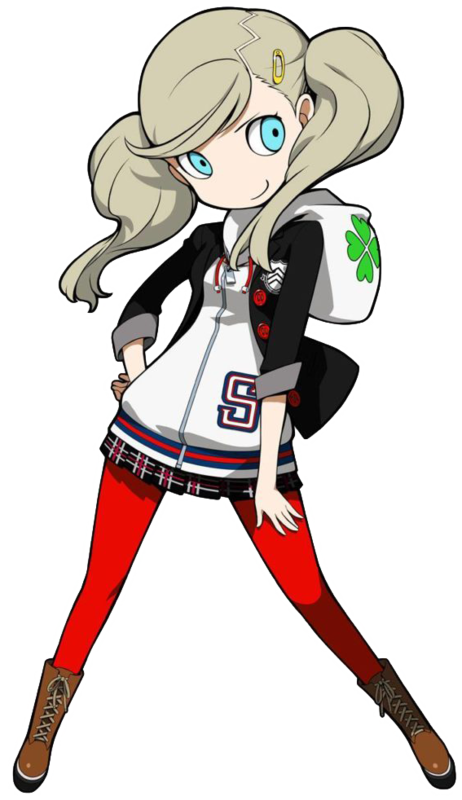 Most actually hailed her as the one to end the outbreak and destroy the essence, but to this day has never answered the call to do it. When confronted about decisions she says nothing and secludes herself in her laboratory within Sunshine Circle. She rarely leaves her lab if only for a moment to gather materials. Those who have tried to enter her lab by force and have a word with her have ended up with wounds. The only conclusion one could come to as to why she isn't a part of the decisions to end the disease is the simple fact that she is an extremely patient person. All the time she spends secluded and alone with her thoughts few can only hope she is devising a plan to overcome the outbreak and save the planet. But until the day she finds a flawless solution, Samus keeps to herself and works all hours of the day to keep Life Sphere Central safe from threats.